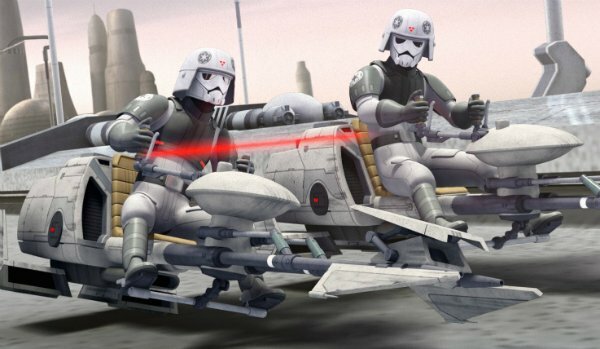 How Will Star Wars: Episode VII Connect With Star Wars Rebels? Anxious to get your first look at some of the things J.J. Abrams and crew have planned for Star Wars: Episode VII? Then you’ll probably want to tune into Disney’s new animated series Star Wars Rebels when it debuts next month. EW spoke with some of the folks behind the new show (including Executive Producer Simon Kinberg), and it’s been revealed that the Rebels team is in close contact with the Episode VII crew. Disney and LucasFilm are very concerned about maintaining cohesion across the Star Wars universe moving into this new trilogy of films, so anything introduced in Star Wars Rebels (and presumably, the spin-off films scheduled down the line) needs to align with established canon. What this means for fans is that Star Wars Rebels could provide us with a sneak peek at what J.J. Abrams and company are cooking up in the new film. While the series is set well prior to Episode VII (Rebels takes place between Star Wars Episode III: Revenge of the Sith and Star Wars Episode IV: A New Hope), it could very well feature locations, vehicles, and even characters who will turn up in the new films, according to Kinberg. "There are characters, vehicles, imagery that are introduced in the show before we’ve ever seen them in the movies, possibly including VII." Kinberg promises that the new series will also feature plenty of "set-ups and Easter eggs", including ones tied to the original trilogy of films, so keep your eyes peeled for those as well. Star Wars Rebels is being presented as a sidestory revolving around the events that lead up to A New Hope and the near eradication of Jedi at the hands of the Galactic Empire. A ragtag band of rebels who’ve had their lives affected in negative ways by the Empire help form the resistance from a space freighter named Ghost. It boasts the voice talents of Freddie Prinze Jr. as Kanan Jarrus, a Jedi survivor keeping a low profile aboard the ship as series villain Inquisitor hunts down the last remaining Jedi at the behest of Darth Vader himself. The show also features fan favorites Billy Dee Williams (Lando Calrissian), Anthony Daniels (C-3PO), and R2-D2. Star Wars Rebels is set to make its debut on The Disney Channel on October 3rd, and then it shifts over to Disney XD for the rest of its run beginning October 13th. Judging from the early art and teaser short films, this series looks set to become another great addition to the Star Wars galaxy.